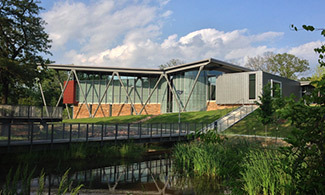 Referred to as a “community-embedded, supportive learning center,” this library offers not only books, but also a performance space, a teaching kitchen, a greenhouse and vegetable garden, and an arboretum. The Director of the Library System’s challenge was to create a playground without equipment, where nature and imagination combine to create grand adventures on a six acre natural site in the heart of the capital city. A charette held with children uncovered a surprising result: their top desire wasn’t for the latest video games… they were concerned about food security – they wanted to learn how to feed themselves. Children also wanted a place that was uplifting, inspirational, and full of natural light, while feeling safe and secure. They wanted a place that “lifted expectations”. The site became an education experience, emphasizing teaching hands-on skills, such as gardening and food preparation. The architecture’s inspiration is based on the childhood memories of many Arkansans, growing up in rural areas where playgrounds were really fields, creeks, utilitarian structures such as barns, sheds, and the constructed forts built by their own hands – something inner-city kids rarely experience; children created their own adventures… The library acts as a large shed in the woods: its roof lifts to the sky as the site falls, sheltering spaces within while visually opening to the site’s restored ecosystem.